I just LOVE this new set - Big On Christmas - lots of possibilties, super quick and easy. Here's a few simple ideas. 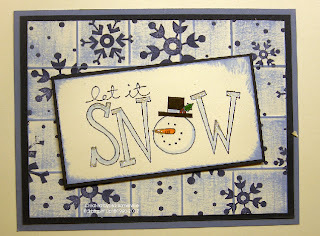 This first one I plan on using as SCS Christmas swap in Denver. I wheeled the Bold Snowflakes in Navy then I used the Scor-It Grid Technique (from the August TJNL) for the background. Sentiment is stamped in Navy and colored with markers. I also added some DD Glitter for sparkle. That is beautiful! I think I may need to get me that set, did not see it in the catalog! !